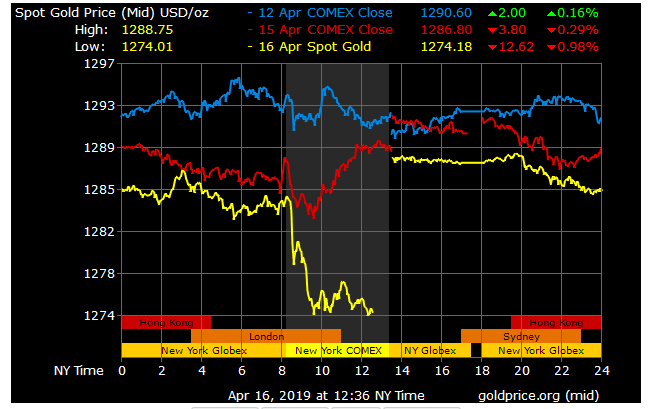 Amid first-quarter earnings thus far, gold has taken a back seat with the precious metal falling one percent on Tuesday to settle at a price of $1,274.31 as of 12:45 p.m. ET. However, analysts remain steadfast that gold could recover and head upward prior to the end of 2019. Last week, gold fell ahead of first-quarter earnings season as the dollar gained while the precious metal slumped to its lowest level of the month last Thursday. Gold fell 1.23 percent at the close of Thursday’s trading session to settle at a price of $1.295.15. Analysts maintain that this is only a temporary setback. From a technical analyst perspective though, one notable traders are watching is gold’s ability to hover around the $1,275 price range, which represents a key Fibonacci retracement level. The recent move under $1,275 could certainly test gold prices with more downward pressure. 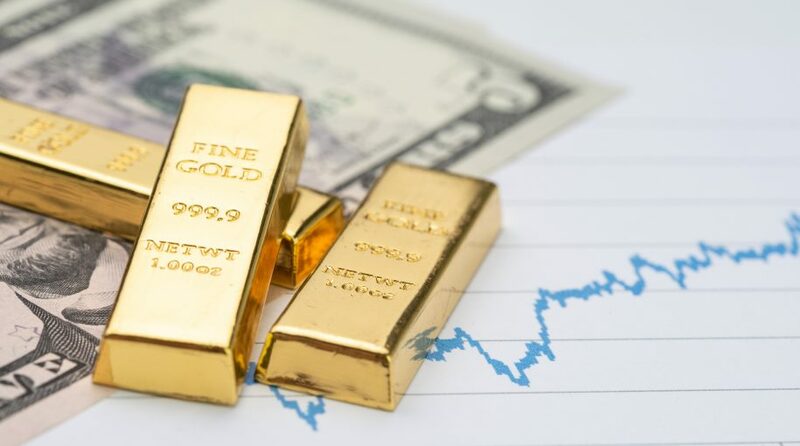 Despite that, Martin Huxley, Singapore-based global head of precious metals at financial services company INTL FCStone, said that gold could hit $1,400 before the end of 2019. “I think that we expect gold to continue to trade pretty much within that range for the coming months,” Huxley told CNBC on Tuesday. “But over the second half of the year we expect it then to grind higher, and potentially it could test 1,400 towards the end of the year,” said Huxley. In addition to gold-backed ETFs like the SPDR Gold Shares (NYSEArca: GLD) and SPDR Gold MiniShares (NYSEArca: GLDM), short-term traders can also play the gold market through miners with the VanEck Vectors Gold Miners (NYSEArca: GDX), Direxion Daily Jr Gold Miners Bull 3X ETF (NYSEArca: JNUG) and the Direxion Daily Gold Miners Bull 3X ETF (NYSEArca: NUGT). Related: Is it Time For Silver For Rally? However, in a world of disruptive technology like robotics and artificial intelligence where growth-minded investors are looking for the next big gains, has the precious metal become obsolete? Of course, less hikes and a rate cut would translate to dollar weakness–an open path for strength in gold. However, according to the minutes published at its last Federal Open Market Committee meeting, the Federal Reserve did leave open the possibility of possible rate hikes this year if the economic data suggests warranting such a move. That, of course, wouldn’t bode well for gold. Still, the wall of worry for investors continues to grow, such as a slowing global growth outlook and inverted yield curves that could send a shift back to the safe confines of gold.